- For 1-ton coils in 300 mm wide. 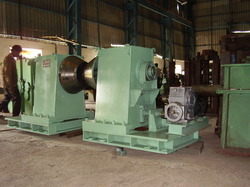 Coil Weight: 500 Kg. Min. to 35 MT Max. Coil Width: 250 mm Min. to 2000 mm Max. Coil Thickness: 0.2 mm Min. to 6 mm Max. Coil Thickness: 0.2 mm Min. to 16 mm Max. 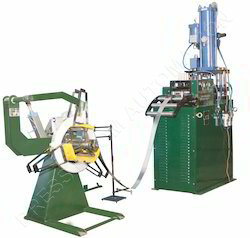 This is JASWINDER brand Manual Operated De coiler Machine Having Capacity of 4feet X 4Ton Coil Capacity.This is Manual Operated No Need of Electrical, Very Cheap Price. we can also provide u as per your requriment. if you have any requirment pls feel free to contact us. Keeping in mind the current market requirement, we are offering best array of Manual Screw Type Decoiler that are easy to install. Comprehending the changed demands of our clientele, we are immersed in offering Uncoiler Machine at very reasonable price. In line with clients' diverse requirements, we are engaged in manufacturing an optimum quality range of Surface Slitter Machine. The 2 in 1 Uncoiler and Straightener offer by our company is perfect for any kind of feeding machine. The 2 in 1 Uncoiler and Straightener that we manufacture is incorporated with high quality equipment and is fabricated with premium quality raw material that makes it demandable in the market. We offer our services for Uncoilers And Coilers for Steel plant Including Design, Development, Detail Engineering, Manufacturing, Assembly, Testing Installation. Wide Range of Uncoilers is offered to meet specific needs – Hydraulic or Manually expandable Mandrel, Single or Twin Head (Duplex) Type, Motorized or Non-Driven Uncoiler are available. Speed of Feed: 15 meter/min.